It is our son's birthday, he requested chilli burgers and chocolate slated caramel cake. Dad did a great job making these for him. Both of these recipes came out of the Food Network Magazine. Both of the of these delicious recipes can be found at the Food Network web site. 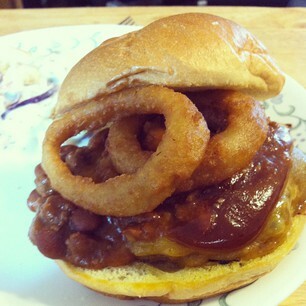 Loaded Chill Cheeseburger: The burger has cheese, chili, BBQ sauce, and onion rings. 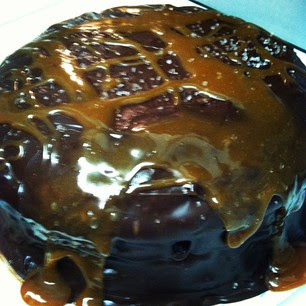 Chocolate-Orange Cake with Salted Caramel: The cake is chocolate, with a chocolate orange ganache and salted caramel. What a great Chili Burger and Happy Birthday to your son! Thank you so much for sharing your awesome recipe with Full Plate Thursday. Hope you are having a great weekend and come back soon! I would like this as my birthday dinner. We were on the same track this week - I posted a salted caramel candy bar!